Roaring Brook Press, 2006. 9781596431607. @bookblrb: Wordless adventures of a good-natured dog who makes friends wherever he goes. A collection of Pequin's (sometimes not safe for work) online comic, Three Word Phrase. It’s full of dark, silly, gross, and absurd laughs. Why I picked it up: I have thought of this comic several times while just going about my business and laughed. That's the sign of a fine comics craftsman. Why I finished it: They’re even better when characters pop up in later comics, building up their crazy mythos. I'd give it to: Heather, because Pequin's gags are simple and fresh, even when they build on a classic comic premise. @bookblrb: A collection of comics that provides dark, silly, gross, and absurd laughs. An extraordinary, timely update on the classic Coleridge poem, in an enthralling graphic format. Written in 1797, “The Rime of the Ancient Mariner” was the original eco-fable. Drawn in 2010, The Rime of the Modern Mariner is a graphic novel, now set in the cesspool of the North Atlantic Garbage Patch—thus adding a timely and resonant message about the destruction of our seas. Hayes’s visually striking debut is drawn with complex, iconic images reminiscent of old woodcuts. Emerging from every exquisite page are the poem’s enduring themes: compassion for nature, a sense of connection among all living things, and rightful outrage at man’s thoughtless destruction of the environment. Powerful and evocative, lush and stark, The Rime of the Modern Mariner will appeal to fans of Habibi and Persepolis. Roaring Brook Press, 2012. 9781596437296. A wordless comic about a boy who runs into an art museum to hide from three boys out to beat him up. 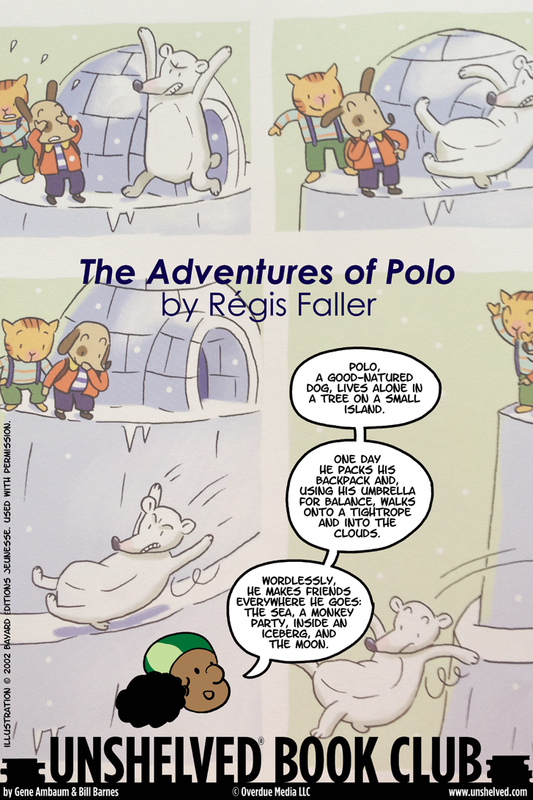 Why I picked it up: I’m a sucker for wordless comics, even if they’re marketed as picture books. Why I finished it: I was surprised when the dog in an old painting came to life and started playing with the boy. It got even better when he led the boy into a painting and then into the world behind the paintings. I'd give it to: My nephew Layton, who’d giggle at the Pied Piper-y way the boy both saves a bunch of dogs from an evil looking butcher and takes care of the bullies. @bookblrb: A wordless comic about a boy who runs into an art museum to hide from three boys out to beat him up. The #1 New York Times bestseller is now available in manga! Tessay Gray thought her journey to London would be the beginning of a new life, but she never could have envisioned the dark turn that life would take….Abuducted upon her arrival, Tessa is introduced to London’s Downworld, the sordid supernatural underbelly of the city, and informed that her future will be recast to service a man known as “the Magister.” Only the intervention of the London Institute’s Shadowhunters delivers the girl from this fate, but sinister forces are still gathering around Tessa. Even so, Tessa’s attraction to two of the young Shadowhunters who have taken her under their wings may prove more dangerous by far…. Growing up in rural Puerto Rico amid political unrest, disease and poverty, Clemente honed his baseball skills with his brother by hitting bottle caps and rolled up socks while his parents taught him the value of hard work, respect, dignity, and generosity. When the Brooklyn Dodgers saw his skills in a tryout camp in 1954, he was signed to a minor league contract. The next season, he began one of baseball’s most successful careers. His quick hands, strength and speed became legendary, as did his passion for the game. He was also one of just a few Hispanic players in the Major Leagues and prejudice was not uncommon. Reporters would mock his broken English, and frequently people treated him as a black man when traveling with the team in segregated parts of the country. He lived by his principles both on and off the field. Until his tragic death in a plane crash in 1972 bringing relief to earthquake victims, he was an outspoken advocate for Hispanic civil rights and a mentor to many young Latino ball players. He was also the first Latin American inducted into the Baseball Hall of Fame. Why I picked it up: I wanted to expand my experience with graphic novels. A colleague mentioned this one, which is about one of my childhood heroes. Why I finished it: I knew quite a bit about Clemente, especially his career. I was intrigued how the author would fit his life story into a brief, illustrated book. It emphasized the major events that shaped his life, and the powerful, stark images made me feel like I experienced the tragic and poignant moments. The section on the 1960 World Series brought back wonderful memories for me. The Pirates rebounded from a 10-0 bashing to win the series in the seventh game on a legendary home run. I'd give it to: Braun, who just finished Promises to Keep: How Jackie Robinson Changed America and really enjoyed it. Latinos consider Roberto the Jackie Robinson of Puerto Rico, and I think Braun will enjoy the similarities of their struggles against prejudice, and the way they both maintained their class while doing so. @bookblrb: Roberto Clemente honed his skills and passion for baseball in rural Puerto Rico. From the creator of Black Hole ("The best graphic novel of the year." —Time; "Burns's masterwork." — The New York Times Book Review), the second part of a new epic masterpiece of graphic horror in brilliant, vivid color. Jewish Lights Publishing, 2006. 9781580233101. Jewish Lights Publishing, 2008. 9781580233477. Jewish Lights Publishing, 2010. 9781580234221. As in the first Rabbi Harvey book, this is a collection of shorts where Rabbi Harvey solves the dilemmas of the people of Elk Spring. He solves mysteries, slyly redistributes wealth to the needy, and takes time to enjoy fishing and meeting a prospective romantic interest. Each story is based on a classic Jewish Rabbi tale. Departing from the short story format, this third book finds Rabbi Harvey in a sticky spot when the wicked Bubbe unleashes her plan to drive him from town. Rabbi Harvey and his lady friend Abigail combine wits to save themselves when they are framed and jailed by the relentless Bubbe bent on running Elk Spring for her own greedy ends. Why I picked it up: I noticed this series on my library website's recently acquired list and had to read it because I really like graphic novels and weird mashups. Why I finished it: I've read just enough Jewish folktales to appreciate the twists in these books. I loved the annual Stump the Rabbi contest in each volume where townsfolk win a fruit pie if they come up with a question Rabbi Harvey can’t answer. The slow moving romance in the second and third volumes is quite sweet, too, especially when Rabbi Harvey keeps getting distracted from the tasks at hand as he debates how to propose. I'd give it to: Els, who not only will laugh out loud at the delightful dry humor generously sprinkled throughout the book but will love watching her daughter’s eyes light up as she catches on to the Rabbi’s crafty wisdom. Not even half a century ago America was segregated, when everything depended on teh color of one's skin. Access to schools, restaurants, parks, buses or even water fountains was segregated. And born into this segregated world was Martin Luther King Jr..
Armed with one the nonviolent teachings of Ghandi and a staunch belief that all men and women were created equal, Martin Luther King Jr. stepped to the forefront of the Civil Rights Movement. Through a series of peaceful protests and amrches, King captured the attention of the world...and changed the lives of millions of Americans forever. A reimagining of the coming of Galactus, Devourer of Worlds, complete with Ultimate universe takes on such Marvel stalwarts as the Silver Surfer, Captain Marvel, the Falcon, and more. Collects Ultimate Nightmare #1-5, Ultimate Vision #0, and Ultimate Extinction #1-5. Why I picked it up: I am an unabashed fan of Marvel Comics’ Ultimate line, a total reboot of their entire universe. It was conceived as a solution to the problem of decades of inscrutable, convoluted backstory intimidating new readers. Ironically, it appeals most to fans like me who love a fresh look at characters we thought we knew. Why I finished it: Marvel threw some of its best talent at this series, and it shows. Ellis thinks big, and even facing global annihilation his heroes always seem to be really enjoying their jobs. I particularly enjoyed his Captain Marvel, a believable take on an alien invader who chose to stay and protect the human race instead of going home. His sexual chemistry with Carol Danvers is hilariously complicated. I'd give it to: Jeff, so we can compare notes about the artistic styles. I want him to explain how the artists of the last chapter made those incredible, patterned tones. I hope it's a quick little trick in Photoshop, but suspect it's just as hard as it looks. @bookblrb: A reimagining of the coming of Galactus, Devourer of Worlds, in Marvel’s Ultimate universe. Lerner / Graphic Universe, 2012. 9781575059419. Zeina was born during the Lebanese Civil War (1975-1990). She was used to bombings, snipers, and the other hazards of living in a war zone. Then one night her parents leave East Beirut (the Christian section) to visit her grandmother in West Beirut (the Muslim section), taking a carefully chosen route to avoid being shot. But when the shelling starts, they are trapped in West Beirut. During the long night spent waiting for her parents' return, Zeina and her brother are watched over and entertained by their neighbors, a colorful and loving group of people who do their best to keep up the children's spirits. Why I picked it up: I've liked many of Lerner's latest graphic novels, such as Little White Duck, and have been trying to read all of their new releases. Why I finished it: Abirached's amazing art. A Game for Swallows is being favorably compared to Persepolis because both feature stark, black-and-white drawings and stories about childhoods spent in the Middle East, but Abirached's work is strong enough to stand on its own merits. Her art has a formal, measured quality. She likes to take her time changing elements within panels, repeating most of the images from one panel to the next with a small change, making it feel like a flip-book. There are lots of swirls and wavy lines -- Zeina's riot of curls shows her youthfulness, subtler curves mar the faces of the careworn adults, and on one amazing three-panel page, Zeina's parents slowly become obscured by curling tendrils of smoke as they burn cigarette after cigarette. Abirached uses both her beautiful art and her quietly effective storytelling to place her readers in the middle of life during wartime. The opening city views at first glance seem like simple street scenes, but as I looked closer I noticed the barbed wire, cinder-blocked windows, and bullet holes. She makes it clear that life in Beirut at that time was anything but simple. I'd give it to: Ben. Ever since his mother served two tours in Afghanistan he's been fascinated with the Middle East, and he'll easily identify with Zeina and her brother patiently waiting for their parents to return while hoping they won’t be killed. @bookblrb: Zeina grew up during the Lebanese Civil War, and became used to the daily hazards of life in a war zone. Adopted at birth and raised by parents who never finished high school, Steve Jobs did not begin life with a head start. But in the end his vision changed personal computing and, by extension, the world itself. Jobs was restless in high school and dropped out early. He wandered to India and Japan, where he picked up Zen Buddhist beliefs that he practiced for the rest of his life. (Some Apple fans still wonder if his minimalistic designs were tied to his Zen.) He partnered with several influential people, notably his friend Steve Wozniak with whom he made one of the first mass-produced personal computers. This driven, passionate man could also be a real stinker, both professionally and personally. He was known for lambasting subordinates and bosses when their work did not meet his expectations. He is responsible for producing a phone phreaking box that allowed his college buddies to steal free phone calls, plus a slew of best-selling Apple computers and electronics. This graphic novel, illustrated minimally and elegantly by Amit Tayal, ends with Jobs’ triumphant return to Apple, from which he had been unceremoniously released years before. It also covers his pancreatic cancer and his death. Why I picked it up: I haven’t had time to tackle Walter Isaacson’s Steve Jobs biography, and I figured this slim book would be a quick way to learn more about him. I'd give it to: Max, who has camped out for each of the iPhone iterations, so that he can read it while standing in line for his iPhone 5 to impress his fellow fanatics. @bookblrb: A short graphic novel biography of Steve Jobs, who experimented with personal hygiene, and was very hard to work for. Drawn & Quarterly, 2012. 9781770460652. The Philistines are fighting the armies of Israel. Goliath of Gath is huge. Despite his gentle soul, he’s outfitted with new armor, a shield, and a spear, then sent to read a message to the enemy. It’s a challenge to send a man to fight him in single combat. Why I picked it up: I loved this graphic novel’s simple cover design, as well as the fact that I can feel a bit of texture from the cover’s fabric. I'd give it to: Jace, who would enjoy Goliath’s young shield bearer, a clumsy kid who hits Goliath in the head with his spear and wonders if Goliath has a “gigantic you-know-what,” but who is willing to fight alongside Goliath with his dagger if need be. @bookblrb: Despite his gentle soul, Goliath is sent out to challenge a man to single combat.